You may have noticed a new blog format in the last day or so. That came about because someone mentioned that post (and possibly comment) visibility was an issue. With the new template, this hopefully won’t be a problem. Font sizes are larger, text color is darker, while the photography gets placed front and center. Site redesign is currently a work in progress. On my “to do” list is a primer in CSS, which is a style sheets language for use in designing web pages written in HTML and XHTML. A reorganization of the Restaurant and Recipe Index is also planned, but that’s later in 2013. You may notice some tweaks down the road, but those shouldn’t negatively affect your viewing experience. As always, I look forward to reading your comments and suggestions. There’s a discussion going on in one of the groups I participate in on Facebook. Essentially, someone brought up the issue of people not knowing what to do with leftovers. Sounds ho-hum, right? Except that the folks in this group are people who create cookbooks. I’m interested in hearing what you have to say, so I’ll ask the same question that an acquaintance asked: “Is it necessary for the food media (which can be anyone, not necessarily cookbook writers — can be television shows, magazine and newspaper journalists, food bloggers, chefs and cooking school instructors) to speak to their respective audience(s) about how to use leftovers?” You’ll probably want to read this article first, so you can get the back story. Too many people shop for food by buying for something, instead of seeing what looks good that’s available before they buy. There’s a subtle difference there, one that I slowly learned to appreciate during last year’s project. With an open mind and some inspiration, you can begin to see all the myriad possibilities that present themselves at the market, and maybe teach yourself something in the end. Lately I’ve been cooking with radicchio, endive and escarole … in soups, salads, vegetable sides and main courses. Winter greens have a different flavor and color palette, compared to those in the spring, summer and autumn. They tend to be bitter-tasting, and demand being paired with sweet, salty or slightly acidic accompaniments, the better to withstand their assertiveness. 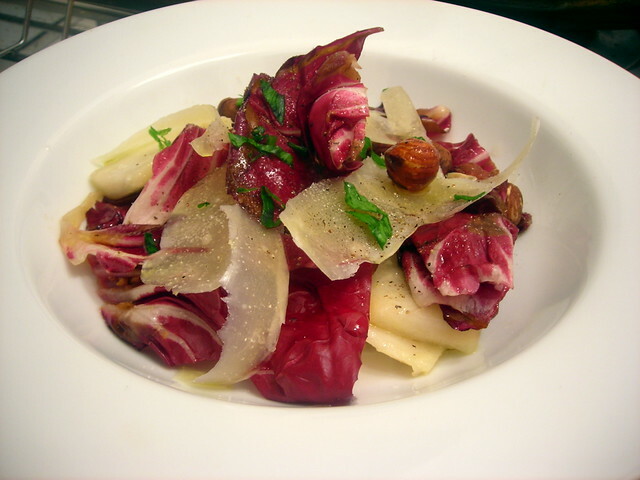 One fine example is tonight’s salad — warm radicchio, pear and hazelnut salad. In a small bowl, combine the water and 1 tablespoon lemon juice. Cut the pears into 1/4″ thick wedges, then place the wedges in the bowl of water. This will help stop any browning that might occur from oxidation. Melt the butter in a large skillet over medium heat. Drain the pears and add them to the pan. Sauté over medium heat or until the pears are lightly glazed and are golden brown. Remove from heat; spoon the pears into a bowl. In the same skillet, add the radicchio leaves. Lightly wilt the radicchio over low heat, about 1-2 minutes, then remove the pan from heat. Spoon the radicchio into the same bowl as the pears. Stir in the hazelnuts and the remaining tablespoon of lemon juice. Taste for salt and pepper. Gently toss the radicchio, pears and hazelnuts so that the salad is lightly dressed. Spoon the salad onto individual salad bowls. Top with shaved pecorino cheese and Italian parsley. Serve at once. (1) — If Comice pears are unavailable, Bosc or d’Anjou pears are good substitutes. (2) — This is a mild sheep’s milk cheese from Sardinia, Italy. Pecorino Toscano cheese is a good substitute, as is Parmigiano-Reggiano. You can shave the cheese with a vegetable peeler or a small sharp knife. This is my contribution for Souper (Soup, Salad and Sammie) Sundays for the week of December 31, 2012 to January 6, 2013, a weekly foodblogging event organized and hosted by Deb of Kahakai Kitchen. Memorie di Angelina — Risotto al Radicchio, where Frank presents an unusual risotto featuring radicchio and a soffritto containing pancetta and shallots. Sass & Veracity — Pork Shoulder with Radicchio and Balsamic Vinegar, a recipe that Kelly recently recommended to me on Facebook. I haven’t tried it yet, but it’s something for the future, definitely. Yummy Supper — Radicchio Salad with Cara Cara Oranges, Almonds and Roasted Shallots, a wonderful late winter salad with a luscious contrast in flavor, color and texture. I love this salad so much, I’m looking forward to making it again in a few months. 04 Jan	This entry was published on January 4, 2013 at 3:47 am. It’s filed under Alice Waters, American cuisine, food, food photography, Gluten-Free, recipe, Souper (Soup, Salad & Sammie ) Sundays, vegetarian, winter and tagged Alice Waters, American cuisine, food photography, gluten-free, Nigella Lawson, radicchio, salad, Souper Sundays, vegetarian, winter. Bookmark the permalink. Follow any comments here with the RSS feed for this post. Stash, this Warm radicchio, pear and hazelnut salad recipe is a winner. Thank you for sharing. The format/layout is fantastic too. My pleasure, have a safe fun weekend. LOL. I’m sure you could apply that to most of my blog. Color is one of the things I feel that’s in short supply in winter, so anything that I can do to enhance my experience through the drudgery is most welcome indeed.